This Autumn Winter we’ll be wearing coats, boots and muted colours. Sounds like every other Autumn Winter? That’s because it is. I know you can’t avoid coats, boots and muted colours during the dark months; my point is this week’s NYFW did not blow me away. Don’t get me wrong, there were some lovely pieces – I’m particularly enamoured by Carolina Herrera‘s modern, gorgeous gowns and oversized, cocoon tops and her grey and blue colour palette was so very nice – but overall there wasn’t much to really get excited about. Rebecca Minkhoff’s collection was very cool and very wearable. Boho meets swinging sixties with fringed boots galore (buy yours know to make the most of of them!) but it was quite…familiar. At least you can recycle that fedora you bought a couple of years ago. Take note of the models’ hair and makeup. Shaggy, understated and low maintenance is the name of the game. I approve. 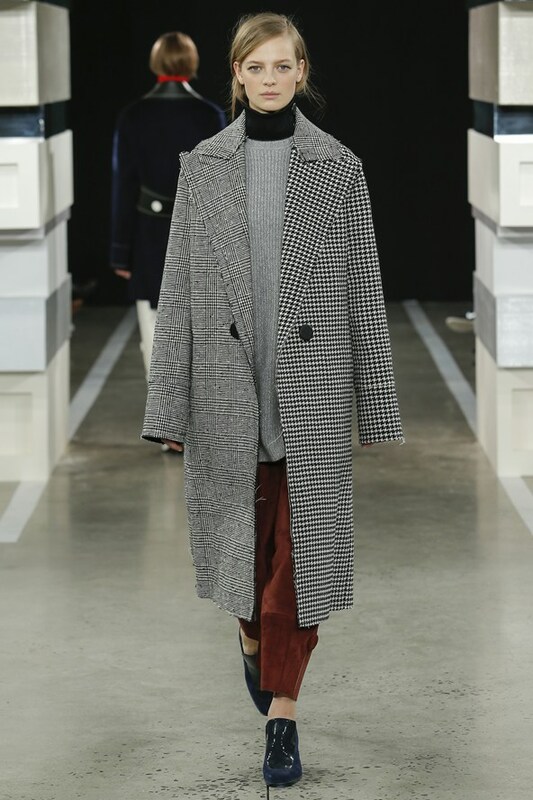 I hope you bought a long coat in the sales this January (I did, I got a dark grey tweed look great coat in Urban Outfitters that is not unlike the DKNY model pictured below) because you will be wearing one after summer. 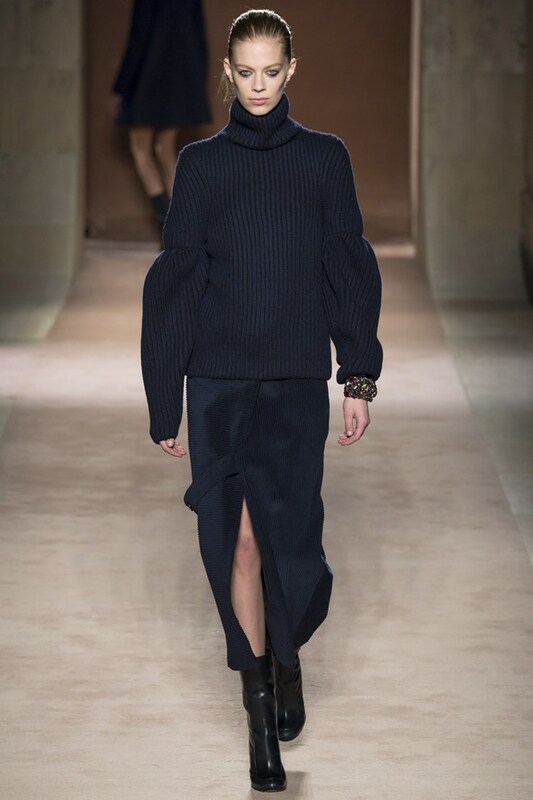 Really lovely versions were seen Edun, which were modelled on the classic martingale coat. As far as prints were concerned Diane Von Furstenberg is the one to look to. Splashes and bird prints featured in her monochromatic collection which was speckled with colour. It was typically lovely. The wrap featured, of course. Kendall Jenner modelled the latest version. Styled with ’90s-esque spot print barely black tights and ’70s style platform sandals, pared back hair and dramatic eyes it’s a look that can – and should be! – copied from right now. Tommy Hilfiger’s collection was so Tommy Hilfiger I wish I had bet on it. The whole collection looked like a 1970s sitting room. 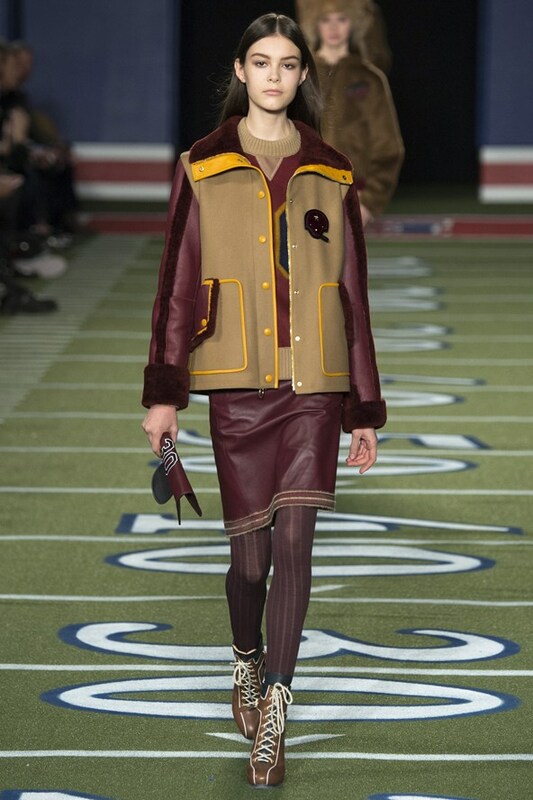 Pantone’s colour of the year, Marsala, featured heavily and American football was a big influence. These pieces will be the most copied on the High Street. One trend that’s going to return in AW 15/16 are oversized scarves; fur stoles featured heavily. Thank you Jason Wu! A military colour scheme will also transfer over from Spring Summer. The overlying theme for AW 15/16 is chic grunge. Layering will be on the cards once again and bagginess over long, structured skirts and boots will be a thing – Victoria Beckham’s collection has seen to that. NYFW wasn’t inspiring per se but the looks from it are so wearable and well, cool that we’ll be ready to wear these trends when Autumn Winter comes around. Or even try a few now that there’s still a chill in the air!